De Picoscope 3425 Differentiaal USB ossilloscoop is ideaal voor de gebruiker die aan zwevende of niet ground gerefereerde signalen moet mwten. Moet u aan zwevende of niet groundgerefereerde signalen meten? Moet u signalen meten waar een 50 Hz of 60 Hz common-mode noise aanwezig is? Met de PicoScope 3425 differentiaal oscilloscoop kunt u dit doen zonder dat u hiervoor dure differentiaal preamplifiers of probes nodig heeft. Most oscilloscopes can only measure signals referenced to ground and have what are known as “single–ended inputs”. The PicoScope 3425 has four fully differential inputs that allow you to measure signals that are not referenced to ground. With a maximum common mode and differential range of 400 V, the PicoScope 3425 is capable of measuring both high voltage and low level signals. Typical high voltage applications include capturing waveforms from switch mode power supplies, telephone cables, motor inverters and hybrid vehicles. The high impedance differential inputs also allow measurements on sensitive amplifiers and from bridge type sensors for pressure, load and strain. The PicoScope 3425 USB Oscilloscope comes in a tough carry case complete with all the probes, leads, clips and adaptors you need to start taking differential measurements (see the specifications for full details of the supplied hardware and software). Just install the user-friendly software, connect the oscilloscope to a USB port on your Windows PC and you’re ready to go. No complicated set up procedures. No effort required. 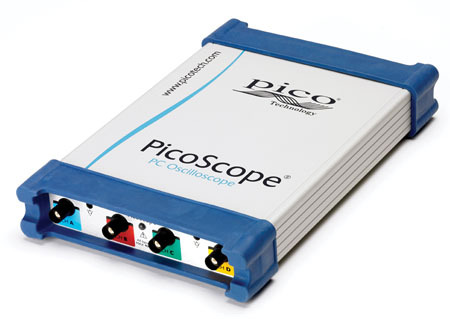 The PicoScope 3425 doesn’t need to be confined to your lab or workbench. Its small, lightweight design makes it the perfect portable differential oscilloscope, while the anti-slip case means that your scope can be used either horizontally or vertically – ideal when space is at a premium.